In Maltese cuisine, stuffed vegetables have a long tradition. The island’s soil and climate offer the right conditions for fruits and vegetables to grow and ripen under the Mediterranean sun with strong tastes and in huge quantities. Tomatoes, onions, marrows, zucchini, aubergines, pumpkins, all fruits and vegetables that are perfect to be filled! Be it with meat, seafood, herbs or other vegetables, you can combine flavours of all kinds or even use your leftovers to create a completely new dish you would have never thought of before. When I’m in an experimental mood, I bravely mix whatever I find in my fridge and shelves, sweet, sour, spicy or bitter, I’ve never been disappointed, but often surprised! A few weeks ago I wrote about my stuffed zucchini, the filling was light and fluffy, made of ricotta, basil and lemon, perfect for the fruit’s soft taste. 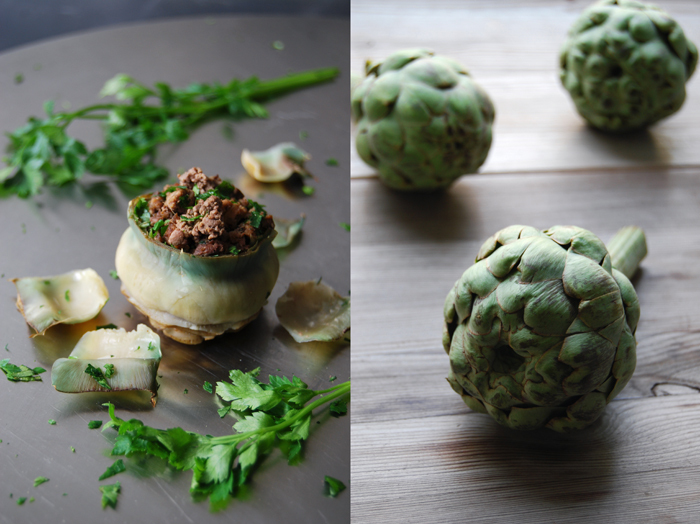 When I decided to stuff some baby artichokes I had a stronger filling in mind, hearty, with minced pork and chicken liver which is an old, traditional Maltese recipe. To refine the meat’s flavours I deglazed it with sweet brandy and infused it with an aromatic bay leaf and a pinch of cumin. 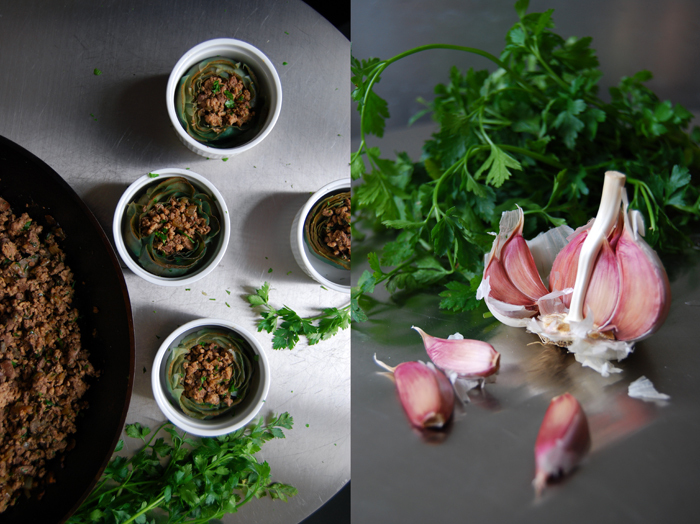 I prepared everything in advance and warmed it up in the oven for a few minutes before dinner, in my little ramekins. The meal pretty and delicious! 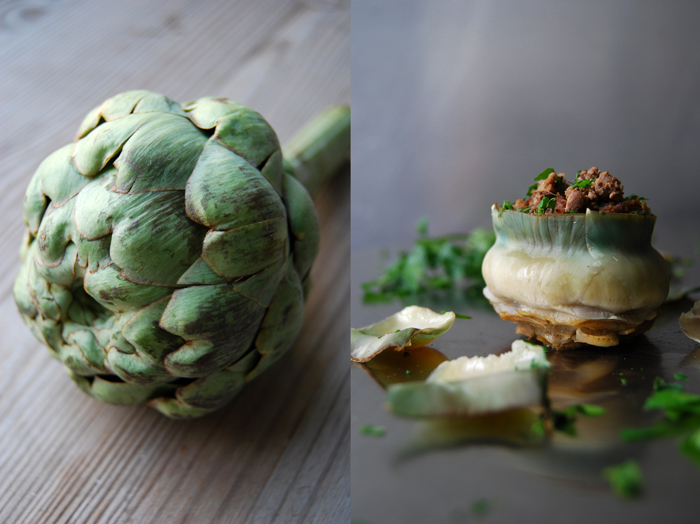 The artichokes can be prepared in advance and warmed up in the oven before serving. Cut off the artichoke stems. If they are soft, peel and chop them finely and set aside. Pluck the hard outer leaves and cut the artichokes’ tips off (1/3 – 1/2 of the artichoke), just the soft, fleshy part of the leaves should be left. Loosen the hairy choke with a knife and scoop it out with a spoon. Keep the prepared artichokes in a bowl of cold water and the juice of half a lemon once they are cut. In a large pot, cook the artichokes in lots of salted water for about 10 minutes or until soft. Set the oven to 200°C /390°F. In a large heavy pan, heat a splash of olive oil and sauté the onion and garlic on medium for a few minutes until soft. If the artichoke stems are soft add them as well. Add a little more olive oil and fry the minced meat for 2-3 minutes. Add the liver, stir and fry for a minute. Add the bay leaf, parsley and cumin, deglaze with brandy and pour in the white wine, cook it down for 2 minutes. 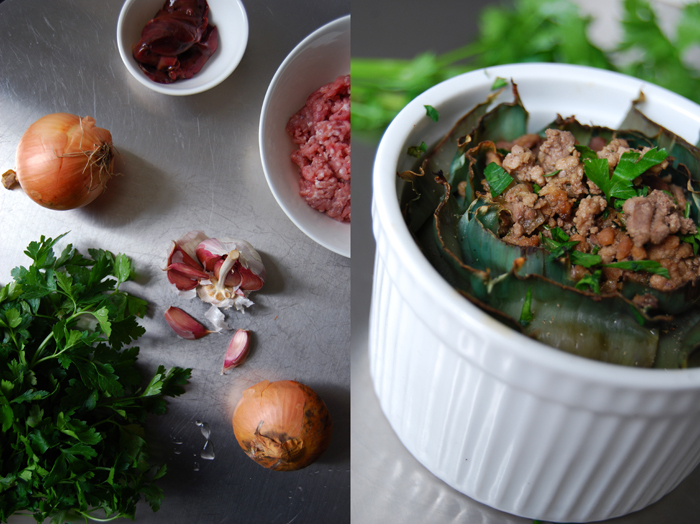 Season with salt and pepper and fill the artichokes with the minced meat mixture. Place the artichokes in a big baking dish or 6 single ramekins, add a dash of white wine to cover the bottom of the dish and cook them in the oven for 5 minutes.